Washington had met defeat in every considerable battle at which he was personally present. His first appearance in military history, in the Ohio campaign against the French, twenty-two years before the Revolution, was marked by a defeat, the surrender of Fort Necessity. Again in the next year, when he fought to relieve the disaster to Braddock’s army, defeat was his portion. Defeat had pursued him in the battles of the Revolution –before New York, at the Brandywine, at Germantown. The campaign against Canada, which he himself planned, had failed. He had lost New York and Philadelphia. But, like William III of England, who in his long struggle with France hardly won a battle and yet forced Louis XIV to accept his terms of peace, Washington, by suddenness in reprisal, by skill in resource when his plans seemed to have been shattered, grew on the hard rock of defeat the flower of victory. There was never a time when Washington was not trusted by men of real military insight or by the masses of the people. But a general who does not win victories in the field is open to attack. By the winter of 1777 when Washington, with his army reduced and needy, was at Valley Forge keeping watch on Howe in Philadelphia, John Adams and others were talking of the sin of idolatry in the worship of Washington, of its flavor of the accursed spirit of monarchy, and of the punishment which “the God of Heaven and Earth” must inflict for such perversity. Adams was all against a Fabian policy and wanted to settle issues forever by a short and strenuous war. The idol, it was being whispered, proved after all to have feet of clay. One general, and only one, had to his credit a really great victory–Gates, to whom Burgoyne had surrendered at Saratoga, and there was a movement to replace Washington by this laureled victor. General Conway, an Irish soldier of fortune, was one of the most troublesome in this plot. He had served in the campaign about Philadelphia but had been blocked in his extravagant demands for promotion; so he turned for redress to Gates, the star in the north. A malignant campaign followed in detraction of Washington. He had, it was said, worn out his men by useless marches; with an army three times as numerous as that of Howe, he had gained no victory; there was high fighting quality in the American army if properly led, but Washington despised the militia; a Gates or a Lee or a Conway would save the cause as Washington could not; and so on. “Heaven has determined to save your country or a weak general and bad counsellors would have ruined it”; so wrote Conway to Gates and Gates allowed the letter to be seen. The words were reported to Washington, who at once, in high dudgeon, called Conway to account. An explosion followed. Gates both denied that he had received a letter with the passage in question, and, at the same time, charged that there had been tampering with his private correspondence. He could not have it both ways. Conway was merely impudent in reply to Washington, but Gates laid the whole matter before Congress. Washington wrote to Gates, in reply to his denials, ironical references to “rich treasures of knowledge and experience” “guarded with penurious reserve” by Conway from his leaders but revealed to Gates. There was no irony in Washington’s reference to malignant detraction and mean intrigue. At the same time he said to Gates: “My temper leads me to peace and harmony with all men,” and he deplored the internal strife which injured the great cause. Conway soon left America. Gates lived to command another American army and to end his career by a crowning disaster. Washington had now been for more than two years in the chief command and knew his problems. It was a British tradition that standing armies were a menace to liberty, and the tradition had gained strength in crossing the sea. Washington would have wished a national army recruited by Congress alone and bound to serve for the duration of the war. There was much talk at the time of a “new model army” similar in type to the wonderful creation of Oliver Cromwell. The Thirteen Colonies became, however, thirteen nations. Each reserved the right to raise its own levies in its own way. To induce men to enlist Congress was twice handicapped. First, it had no power of taxation and could only ask the States to provide what it needed. The second handicap was even greater. When Congress offered bounties to those who enlisted in the Continental army, some of the States offered higher bounties for their own levies of militia, and one authority was bidding against the other. This encouraged short-term enlistments. If a man could re-enlist and again secure a bounty, he would gain more than if he enlisted at once for the duration of the war. An army is an intricate mechanism needing the same variety of agencies that is required for the well-being of a community. The chief aim is, of course, to defeat the enemy, and to do this an army must be prepared to move rapidly. Means of transport, so necessary in peace, are even more urgently needed in war. Thus Washington always needed military engineers to construct roads and bridges. Before the Revolution the greater part of such services had been provided in America by the regular British army, now the enemy. British officers declared that the American army was without engineers who knew the science of war, and certainly the forts on which they spent their skill in the North, those on the lower Hudson, and at Ticonderoga, at the head of Lake George, fell easily before the assailant. Good maps were needed, and in this Washington was badly served, though the defect was often corrected by his intimate knowledge of the country. Another service ill-equipped was what we should now call the Red Cross. Epidemics, and especially smallpox, wrought havoc in the army. Then, as now, shattered nerves were sometimes the result of the strain of military life. “The wind of a ball,” what we should now call shellshock, sometimes killed men whose bodies appeared to be uninjured. To our more advanced knowledge the medical science of the time seems crude. The physicians of New England, today perhaps the most expert body of medical men in the world, were even then highly skillful. But the surgeons and nurses were too few. This was true of both sides in the conflict. Prisoners in hospitals often suffered terribly and each side brought charges of ill-treatment against the other. The prison-ships in the harbor of New York, where American prisoners were confined, became a scandal, and much bitter invective against British brutality is found in the literature of the period. The British leaders, no less than Washington himself, were humane men, and ignorance and inadequate equipment will explain most of the hardships, though an occasional officer on either side was undoubtedly callous in respect to the sufferings of the enemy. Food and clothing, the first vital necessities of an army, were often deplorably scarce. In a land of farmers there was food enough. Its lack in the army was chiefly due to bad transport. Clothing was another matter. One of the things insisted upon in a well-trained army is a decent regard for appearance, and in the eyes of the French and the British officers the American army usually seemed rather unkempt. The formalities of dress, the uniformity of pipe-clay and powdered hair, of polished steel and brass, can of course be overdone. The British army had too much of it, but to Washington’s force the danger was of having too little. It was not easy to induce farmers and frontiersmen who at home began the day without the use of water, razor, or brush, to appear on parade clean, with hair powdered, faces shaved, and clothes neat. In the long summer days the men were told to shave before going to bed that they might prepare the more quickly for parade in the morning, and to fill their canteens over night if an early march was imminent. Some of the regiments had uniforms which gave them a sufficiently smart appearance. The cocked hat, the loose hunting shirt with its fringed border, the breeches of brown leather or duck, the brown gaiters or leggings, the powdered hair, were familiar marks of the soldier of the Revolution. During a great part of the war, however, in spite of supplies brought from both lance and the West Indies, Washington found it difficult to secure for his men even decent clothing of any kind, whether of military cut or not. More than a year after he took command, in the fighting about New York, a great part of his army had no more semblance of uniform than hunting shirts on a common pattern. In the following December, he wrote of many men as either shivering in garments fit only for summer wear or as entirely naked. There was a time in the later campaign in the South when hundreds of American soldiers marched stark naked, except for breech cloths. One of the most pathetic hardships of the soldier’s life was due to the lack of boots. More than one of Washington’s armies could be tracked by the bloody footprints of his barefooted men. Near the end of the war Benedict Arnold, who knew whereof he spoke, described the American army as “illy clad, badly fed, and worse paid,” pay being then two or three years overdue. On the other hand, there is evidence that life in the army was not without its compensations. Enforced dwelling in the open air saved men from diseases such as consumption and the movement from camp to camp gave a broader outlook to the farmer’s sons. The army could usually make a brave parade. On ceremonial occasions the long hair of the men would be tied back and made white with powder, even though their uniforms were little more than rags. The men carried weapons some of which, in, at any rate, the early days of the war, were made by hand at the village smithy. A man might take to the war a weapon forged by himself. The American soldier had this advantage over the British soldier, that he used, if not generally, at least in some cases, not the smooth-bore musket but the grooved rifle by which the ball was made to rotate in its flight. The fire from this rifle was extremely accurate. At first weapons were few and ammunition was scanty, but in time there were importations from France and also supplies from American gun factories. The standard length of the barrel was three and a half feet, a portentous size compared with that of the modern weapon. The loading was from the muzzle, a process so slow that one of the favorite tactics of the time was to await the fire of the enemy and then charge quickly and bayonet him before he could reload. The old method of firing off the musket by means of slow matches kept alight during action was now obsolete; the latest device was the flintlock. But there was always a measure of doubt whether the weapon would go off. Partly on this account Benjamin Franklin, the wisest man of his time, declared for the use of the pike of an earlier age rather than the bayonet and for bows and arrows instead of firearms. A soldier, he said, could shoot four arrows to one bullet. An arrow wound was more disabling than a bullet wound; and arrows did not becloud the vision with smoke. The bullet remained, however, the chief means of destruction, and the fire of Washington’s soldiers usually excelled that of the British. These, in their turn, were superior in the use of the bayonet. Powder and lead were hard to get. The inventive spirit of America was busy with plans to procure saltpeter and other ingredients for making powder, but it remained scarce. Since there was no standard firearm, each soldier required bullets specially suited to his weapon. The men melted lead and cast it in their own bullet-molds. It is an instance of the minor ironies of war that the great equestrian statue of George III, which had been erected in New York in days more peaceful, was melted into bullets for killing that monarch’s soldiers. Another necessity was paper for cartridges and wads. The cartridge of that day was a paper envelope containing the charge of ball and powder. This served also as a wad, after being emptied of its contents, and was pushed home with a ramrod. A store of German Bibles in Pennsylvania fell into the hands of the soldiers at a moment when paper was a crying need, and the pages of these Bibles were used for wads. The artillery of the time seems feeble compared with the monster weapons of death which we know in our own age. Yet it was an important factor in the war. It is probable that before the war not a single cannon had been made in the colonies. From the outset Washington was hampered for lack of artillery. Neutrals, especially the Dutch in the West Indies, sold guns to the Americans, and France was a chief source of supply during long periods when the British lost the command of the sea. There was always difficulty about equipping cavalry, especially in the North. The Virginian was at home on horseback, and in the farther South bands of cavalry did service during the later years of the war, but many of the fighting riders of today might tomorrow be guiding their horses peacefully behind the plough. The pay of the soldiers remained to Washington a baffling problem. When the war ended their pay was still heavily in arrears. The States were timid about imposing taxation and few if any paid promptly the levies made upon them. Congress bridged the chasm in finance by issuing paper money which so declined in value that, as Washington said grimly, it required a wagon-load of money to pay for a wagon-load of supplies. The soldier received his pay in this money at its face value, and there is little wonder that the “continental dollar” is still in the United States a symbol of worthlessness. At times the lack of pay caused mutiny which would have been dangerous but for Washington’s firm and tactful management in the time of crisis. There was in him both the kindly feeling of the humane man and the rigor of the army leader. He sent men to death without flinching, but he was at one with his men in their sufferings, and no problem gave him greater anxiety than that of pay, affecting, as it did, the health and spirits of men who, while unpaid, had no means of softening the daily tale of hardship. Desertion was always hard to combat. With the homesickness which led sometimes to desertion Washington must have had a secret sympathy, for his letters show that he always longed for that pleasant home in Virginia which he did not allow himself to revisit until nearly the end of the war. The land of a farmer on service often remained untilled, and there are pathetic cases of families in bitter need because the breadwinner was in the army. In frontier settlements his absence sometimes meant the massacre of his family by the savages. There is little wonder that desertion was common, so common that after a reverse the men went away by hundreds. As they usually carried with them their rifles and other equipment, desertion involved a double loss. On one occasion some soldiers undertook for themselves the punishment of deserters. Men of the First Pennsylvania Regiment who had recaptured three deserters, beheaded one of them and returned to their camp with the head carried on a pole. More than once it happened that condemned men were paraded before the troops for execution with the graves dug and the coffins lying ready. The death sentence would be read, and then, as the firing party took aim, a reprieve would be announced. The reprieve in such circumstances was omitted often enough to make the condemned endure the real agony of death. Religion offered its consolations in the army and Washington gave much thought to the service of the chaplains. He told his army that fine as it was to be a patriot it was finer still to be a Christian. It is an odd fact that, though he attended the Anglican Communion service before and after the war, he did not partake of the Communion during the war. What was in his mind we do not know. He was disposed, as he said himself, to let men find “that road to Heaven which to them shall seem the most direct,” and he was without Puritan fervor, but he had deep religious feeling. 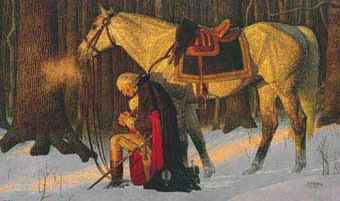 During the troubled days at Valley Forge a neighbor came upon him alone in the bush on his knees praying aloud, and stole away unobserved. He would not allow in the army a favorite Puritan custom of burning the Pope in effigy, and the prohibition was not easily enforced among men, thousands of whom bore scriptural names from ancestors who thought the Pope anti-Christ. Washington’s winter quarters at Valley Forge were only twenty miles from Philadelphia, among hills easily defended. It is matter for wonder that Howe, with an army well equipped, did not make some attempt to destroy the army of Washington which passed the winter so near and in acute distress. The Pennsylvania Loyalists, with dark days soon to come, were bitter at Howe’s inactivity, full of tragic meaning for themselves. He said that he could achieve nothing permanent by attack. It may be so; but it is a sound principle in warfare to destroy the enemy when this is possible. There was a time when in Washington’s whole force not more than two thousand men were in a condition to fight. Congress was responsible for the needs of the army but was now, in sordid inefficiency, cooped up in the little town of York, eighty miles west of Valley Forge, to which it had fled. There was as yet no real federal union. The seat of authority was in the State Governments, and we need not wonder that, with the passing of the first burst of devotion which united the colonies in a common cause, Congress declined rapidly in public esteem. “What a lot of damned scoundrels we had in that second Congress” said, at a later date, Gouverneur Morris of Philadelphia to John Jay of New York, and Jay answered gravely, “Yes, we had.” The body, so despised in the retrospect, had no real executive government, no organized departments. Already before Independence was proclaimed there had been talk of a permanent union, but the members of Congress had shown no sense of urgency, and it was not until November 15, 1777, when the British were in Philadelphia and Congress was in exile at York, that Articles of Confederation were adopted. By the following midsummer many of the States had ratified these articles, but Maryland, the last to assent, did not accept the new union until 1781, so that Congress continued to act for the States without constitutional sanction during the greater part of the war. The ineptitude of Congress is explained when we recall that it was a revolutionary body which indeed controlled foreign affairs and the issues of war and peace, coined money, and put forth paper money but had no general powers. Each State had but one vote, and thus a small and sparsely settled State counted for as much as populous Massachusetts or Virginia. The Congress must deal with each State only as a unit; it could not coerce a State; and it had no authority to tax or to coerce individuals. The utmost it could do was to appeal to good feeling, and when a State felt that it had a grievance such an appeal was likely to meet with a flaming retort. Washington maintained towards Congress an attitude of deference and courtesy which it did not always deserve. The ablest men in the individual States held aloof from Congress. They felt that they had more dignity and power if they sat in their own legislatures. The assembly which in the first days had as members men of the type of Washington and Franklin sank into a gathering of second-rate men who were divided into fierce factions. They debated interminably and did little. Each member usually felt that he must champion the interests of his own State against the hostility of others. It was not easy to create a sense of national life. The union was only a league of friendship. States which for a century or more had barely acknowledged their dependence upon Great Britain, were chary about coming under the control of a new centralizing authority at Philadelphia. The new States were sovereign and some of them went so far as to send envoys of their own to negotiate with foreign powers in Europe. When it was urged that Congress should have the power to raise taxes in the States, there were patriots who asked sternly what the war was about if it was not to vindicate the principle that the people of a State alone should have power of taxation over themselves. Of New England all the other States were jealous and they particularly disliked that proud and censorious city which already was accused of believing that God had made Boston for Himself and all the rest of the world for Boston. The religion of New England did not suit the Anglicans of Virginia or the Roman Catholics of Maryland, and there was resentful suspicion of Puritan intolerance. John Adams said quite openly that there were no religious teachers in Philadelphia to compare with those of Boston and naturally other colonies drew away from the severe and rather acrid righteousness of which he was a type. Inefficiency meanwhile brought terrible suffering at Valley Forge, and the horrors of that winter remain still vivid in the memory of the American people. The army marched to Valley Forge on December 17, 1777, and in midwinter everything from houses to entrenchments had still to be created. At once there was busy activity in cutting down trees for the log huts. They were built nearly square, sixteen feet by fourteen, in rows, with the door opening on improvised streets. Since boards were scarce, and it was difficult to make roofs rainproof, Washington tried to stimulate ingenuity by offering a reward of one hundred dollars for an improved method of roofing. The fireplaces of wood were protected with thick clay. Firewood was abundant, but, with little food for oxen and horses, men had to turn themselves into draught animals to bring in supplies. Sometimes the army was for a week without meat. Many horses died for lack of forage or of proper care, a waste which especially disturbed Washington, a lover of horses. When quantities of clothing were ready for use, they were not delivered at Valley Forge owing to lack of transport. Washington expressed his contempt for officers who resigned their commissions in face of these distresses. No one, he said, ever heard him say a word about resignation. There were many desertions but, on the whole, he marveled at the patience of his men and that they did not mutiny. With a certain grim humor they chanted phrases about “no pay, no clothes, no provisions, no rum,” and sang an ode glorifying war and Washington. Hundreds of them marched barefoot, their blood staining the snow or the frozen ground while, at the same time, stores of shoes and clothing were lying unused somewhere on the roads to the camp. Sickness raged in the army. Few men at Valley Forge, wrote Washington, had more than a sheet, many only part of a sheet, and some nothing at all. Hospital stores were lacking. For want of straw and blankets the sick lay perishing on the frozen ground. When Washington had been at Valley Forge for less than a week, he had to report nearly three thousand men unfit for duty because of their nakedness in the bitter winter. Then, as always, what we now call the “profiteer” was holding up supplies for higher prices. To the British at Philadelphia, because they paid in gold, things were furnished which were denied to Washington at Valley Forge, and he announced that he would hang any one who took provisions to Philadelphia. To keep his men alive Washington had sometimes to take food by force from the inhabitants and then there was an outcry that this was robbery. With many sick, his horses so disabled that he could not move his artillery, and his defenses very slight, he could have made only a weak fight had Howe attacked him. Yet the legislature of Pennsylvania told him that, instead of lying quiet in winter quarters, he ought to be carrying on an active campaign. In most wars irresponsible men sitting by comfortable firesides are sure they knew best how the thing should be done. The bleak hillside at Valley Forge was something more than a prison. Washington’s staff was known as his family and his relations with them were cordial and even affectionate. The young officers faced their hardships cheerily and gave meager dinners to which no one might go if he was so well off as to have trousers without holes. They talked and sang and jested about their privations. By this time many of the bad officers, of whom Washington complained earlier, had been weeded out and he was served by a body of devoted men. There was much good comradeship. Partnership in suffering tends to draw men together. In the company which gathered about Washington, two men, mere youths at the time, have a world-wide fame. The young Alexander Hamilton, barely twenty-one years of age, and widely known already for his political writings, had the rank of lieutenant colonel gained for his services in the fighting about New York. He was now Washington’s confidential secretary, a position in which he soon grew restless. His ambition was to be one of the great military leaders of the Revolution. Before the end of the war he had gone back to fighting and he distinguished himself in the last battle of the war at Yorktown. The other youthful figure was the Marquis de La Fayette. It is not without significance that a noble square bears his name in the capital named after Washington. The two men loved each other. The young French aristocrat, with both a great name and great possessions, was fired in 1776, when only nineteen, with zeal for the American cause. “With the welfare of America,” he wrote to his wife, “is closely linked the welfare of mankind.” Idealists in France believed that America was leading in the remaking of the world. When it was known that La Fayette intended to go to fight in America, the King of France forbade it, since France had as yet no quarrel with England. The youth, however, chartered a ship, landed in South Carolina, hurried to Philadelphia, and was a major general in the American army when he was twenty years of age. La Fayette rendered no serious military service to the American cause. He arrived in time to fight in the battle of the Brandywine. Washington praised him for his bravery and military ardor and wrote to Congress that he was sensible, discreet, and able to speak English freely. It was with an eye to the influence in France of the name of the young noble that Congress advanced him so rapidly. La Fayette was sincere and generous in spirit. He had, however, little military capacity. Later when he might have directed the course of the French Revolution he was found wanting in force of character. The great Mirabeau tried to work with him for the good of France, but was repelled by La Fayette’s jealous vanity, a vanity so greedy of praise that Jefferson called it a “canine appetite for popularity and fame.” La Fayette once said that he had never bad a thought with which he could reproach himself, and he boasted that he has mastered three kings–the King of England in the American Revolution, the King of France, and King Mob of Paris during the upheaval in France. He was useful as a diplomatist rather than as a soldier. Later, in an hour of deep need, Washington sent La Fayette to France to ask for aid. He was influential at the French court and came back with abundant promises, which were in part fulfilled. Washington himself and Oliver Cromwell are perhaps the only two civilian generals in history who stand in the first rank as military leaders. It is doubtful indeed whether it is not rather character than military skill which gives Washington his place. Only one other general of the Revolution attained to first rank even in secondary fame. Nathanael Greene was of Quaker stock from Rhode Island. He was a natural student and when trouble with the mother country was impending in 1774 he spent the leisure which he could spare from his forges in the study of military history and in organizing the local militia. Because of his zeal for military service he was expelled from the Society of Friends. In 1775 when war broke out he was promptly on hand with a contingent from Rhode Island. In little more than a year and after a very slender military experience he was in command of the army on Long Island. On the Hudson defeat not victory was his lot. He had, however, as much stern resolve as Washington. He shared Washington’s success in the attack on Trenton, and his defeats at the Brandywine and at Germantown. Now he was at Valley Forge, and when, on March 2, 1778, he became quartermaster general, the outlook for food and supplies steadily improved. Later, in the South, he rendered brilliant service which made possible the final American victory at Yorktown. Henry Knox, a Boston bookseller, had, like Greene, only slight training for military command. It shows the dearth of officers to fight the highly disciplined British army that Knox, at the age of twenty-five, and fresh from commercial life, was placed in charge of the meager artillery which Washington had before Boston. It was Knox, who, with heart-breaking labor, took to the American front the guns captured at Ticonderoga. Throughout the war he did excellent service with the artillery, and Washington placed a high value upon his services. He valued too those of Daniel Morgan, an old fighter in the Indian wars, who left his farm in Virginia when war broke out, and marched his company of riflemen to join the army before Boston. He served with Arnold at the siege of Quebec, and was there taken prisoner. He was exchanged and had his due revenge when he took part in the capture of Burgoyne’s army. He was now at Valley Forge. Later he had a command under Greene in the South and there, as we shall see, he won the great success of the Battle of Cowpens in January, 1781. It was the peculiar misfortune of Washington that the three men, Arnold, Lee, and Gates, who ought to have rendered him the greatest service, proved unfaithful. Benedict Arnold, next to Washington himself, was probably the most brilliant and resourceful soldier of the Revolution. Washington so trusted him that, when the dark days at Valley Forge were over, he placed him in command of the recaptured federal capital. Today the name of Arnold would rank high in the memory of a grateful country had he not fallen into the bottomless pit of treason. The same is in some measure true of Charles Lee, who was freed by the British in an exchange of prisoners and joined Washington at Valley Forge late in the spring of 1778. Lee was so clever with his pen as to be one of the reputed authors of the Letters of Junius. He had served as a British officer in the conquest of Canada, and later as major general in the army of Poland. He had a jealous and venomous temper and could never conceal the contempt of the professional soldier for civilian generals. He, too, fell into the abyss of treason. Horatio Gates, also a regular soldier, had served under Braddock and was thus at that early period a comrade of Washington. Intriguer he was, but not a traitor. It was incompetence and perhaps cowardice which brought his final ruin. Europe had thousands of unemployed officers some of whom had had experience in the Seven Years’ War and many turned eagerly to America for employment. There were some good soldiers among these fighting adventurers. Kosciuszko, later famous as a Polish patriot, rose by his merits to the rank of brigadier general in the American army; De Kalb, son of a German peasant, though not a baron, as he called himself, proved worthy of the rank of a major general. There was, however, a flood of volunteers of another type. French officers fleeing from their creditors and sometimes under false names and titles, made their way to America as best they could and came to Washington with pretentious claims. Germans and Poles there were, too, and also exiles from that unhappy island which remains still the most vexing problem of British politics. Some of them wrote their own testimonials; some, too, were spies. On the first day, Washington wrote, they talked only of serving freely a noble cause, but within a week were demanding promotion and advance of money. Sometimes they took a high tone with members of Congress who had not courage to snub what Washington called impudence and vain boasting. “I am haunted and teased to death by the importunity of some and dissatisfaction of others” wrote Washington of these people. One foreign officer rendered incalculable service to the American cause. It was not only on the British side that Germans served in the American Revolution. The Baron yon Steuben was, like La Fayette, a man of rank in his own country, and his personal service to the Revolution was much greater than that of La Fayette. Steuben had served on the staff of Frederick the Great and was distinguished for his wit and his polished manners. There was in him nothing of the needy adventurer. The sale of Hessian and other troops to the British by greedy German princes was met in some circles in Germany by a keen desire to aid the cause of the young republic. Steuben, who held a lucrative post, became convinced, while on a visit to Paris, that he could render service in training the Americans. With quick sympathy and showing no reserve in his generous spirit he abandoned his country, as it proved forever, took ship for the United States, and arrived in November, 1777. Washington welcomed him at Valley Forge in the following March. He was made Inspector General and at once took in hand the organization of the army. He prepared “Regulations for the Order and Discipline of the Troops of the United States” later, in 1779, issued as a book. Under this German influence British methods were discarded. The word of command became short and sharp. The British practice of leaving recruits to be trained by sergeants, often ignorant, coarse, and brutal, was discarded, and officers themselves did this work. The last letter which Washington wrote before he resigned his command at the end of the war was to thank Steuben for his invaluable aid. Charles Lee did not believe that American recruits could be quickly trained so as to be able to face the disciplined British battalions. Steuben was to prove that Lee was wrong to Lee’s own entire undoing at Monmouth when fighting began in 1778. The British army in America furnished sharp contrasts to that of Washington. If the British jeered at the fighting quality of citizens, these retorted that the British soldier was a mere slave. There were two great stains upon the British system, the press-gang and flogging. Press-gangs might seize men abroad in the streets of a town and, unless they could prove that they were gentlemen in rank, they could be sent in the fleet to serve in the remotest corners of the earth. In both navy and army flogging outraged the dignity of manhood. The liability to this brutal and degrading punishment kept all but the dregs of the populace from enlisting in the British army. It helped to fix the deep gulf between officers and men. Forty years later Napoleon Bonaparte, despot though he might be, was struck by this separation. He himself went freely among his men, warmed himself at their fire, and talked to them familiarly about their work, and he thought that the British officer was too aloof in his demeanor. In the British army serving in America there were many officers of aristocratic birth and long training in military science. When they found that American officers were frequently drawn from a class of society which in England would never aspire to a commission, and were largely self-taught, not unnaturally they jeered at an army so constituted. Another fact excited British disdain. The Americans were technically rebels against their lawful ruler, and rebels in arms have no rights as belligerents. When the war ended more than a thousand American prisoners were still held in England on the capital charge of treason. Nothing stirred Washington’s anger more deeply than the remark sometimes made by British officers that the prisoners they took were receiving undeserved mercy when they were not hanged. There was much debate at Valley Forge as to the prospect for the future. When we look at available numbers during the war we appreciate the view of a British officer that in spite of Washington’s failures and of British victories the war was serious, “an ugly job, a damned affair indeed.” The population of the colonies–some 2,500,000–was about one-third that of the United Kingdom; and for the British the war was remote from the base of supply. In those days, considering the means of transport, America was as far from England as at the present day is Australia. Sometimes the voyage across the sea occupied two and even three months, and, with the relatively small ships of the time, it required a vast array of transports to carry an army of twenty or thirty thousand men. In the spring of 1776 Great Britain had found it impossible to raise at home an army of even twenty thousand men for service in America, and she was forced to rely in large part upon mercenary soldiers. This was nothing new. Her island people did not like service abroad and this unwillingness was intensified in regard to war in remote America. Moreover Whig leaders in England discouraged enlistment. They were bitterly hostile to the war which they regarded as an attack not less on their own liberties than on those of America. It would be too much to ascribe to the ignorant British common soldier of the time any deep conviction as to the merits or demerits of the cause for which he fought. There is no evidence that, once in the army, he was less ready to attack the Americans than any other foe. Certainly the Americans did not think he was half-hearted. The British soldier fought indeed with more resolute determination than did the hired auxiliary at his side. These German troops played a notable part in the war. The despotic princes of the lesser German states were accustomed to sell the services of their troops. Despotic Russia, too, was a likely field for such enterprise. When, however, it was proposed to the Empress Catherine II that she should furnish twenty thousand men for service in America she retorted with the sage advice that it was England’s true interest to settle the quarrel in America without war. Germany was left as the recruiting field. British efforts to enlist Germans as volunteers in her own army were promptly checked by the German rulers and it was necessary literally to buy the troops from their princes. One-fourth of the able-bodied men of Hesse-Cassel were shipped to America. They received four times the rate of pay at home and their ruler received in addition some half million dollars a year. The men suffered terribly and some died of sickness for the homes to which thousands of them never returned. German generals, such as Knyphausen and Riedesel, gave the British sincere and effective service. The Hessians were, however, of doubtful benefit to the British. It angered the Americans that hired troops should be used against them, an anger not lessened by the contempt which the Hessians showed for the colonial officers as plebeians. The two sides were much alike in their qualities and were skillful in propaganda. In Britain lurid tales were told of the colonists scalping the wounded at Lexington and using poisoned bullets at Bunker Hill. In America every prisoner in British hands was said to be treated brutally and every man slain in the fighting to have been murdered. The use of foreign troops was a fruitful theme. The report ran through the colonies that the Hessians were huge ogre-like monsters, with double rows of teeth round each jaw, who had come at the call of the British tyrant to slay women and children. In truth many of the Hessians became good Americans. In spite of the loyalty of their officers they were readily induced to desert. The wit of Benjamin Franklin was enlisted to compose telling appeals, translated into simple German, which promised grants of land to those who should abandon an unrighteous cause. The Hessian trooper who opened a packet of tobacco might find in the wrapper appeals both to his virtue and to his cupidity. It was easy for him to resist them when the British were winning victories and he was dreaming of a return to the Fatherland with a comfortable accumulation of pay, but it was different when reverses overtook British arms. Then many hundreds slipped away; and today their blood flows in the veins of thousands of prosperous American farmers.